An RT crew has witnessed the first-ever combat operation of Russia’s flagship aircraft carrier ‘Admiral Kuznetsov’ as Su-33 fighter jets have been launching from its deck to carry out strikes against jihadists in Homs and Idlib provinces. On Tuesday, the Russian military launched a large-scale operation against terrorists in two provinces of Syria with the ‘Admiral Kuznetsov’ and the frigate ‘Admiral Grigorovich’, part of the Russian naval group off the Syrian coast in the eastern Mediterranean, participating in the strikes. It took the RT crew some half-an-hour aboard a helicopter to get to the carrier from the Russian airbase in Latakia province, Syria. 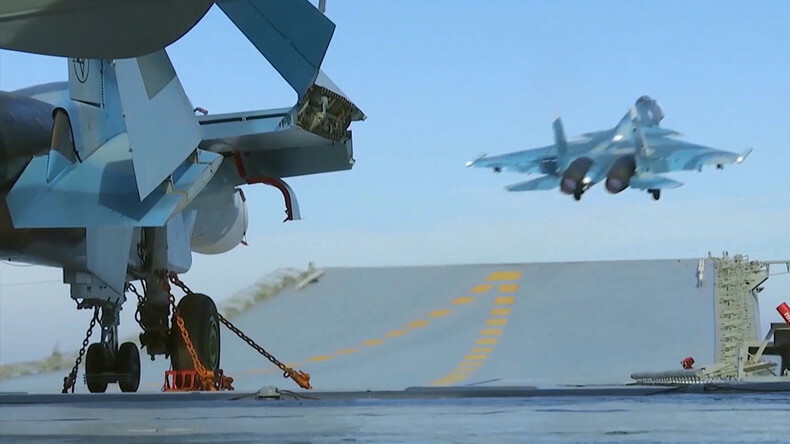 “When we arrived [the aircraft] had been busy carrying out practice flights and perfecting take-offs, landings and air maneuvers with the ultimate goal of defeating terrorism in Syria,” RT’s Igor Zhdanov reported from the carrier. He said that all the jets on the deck were fully equipped with weaponry and ready for the combat mission, carrying high-precision 500kg bombs that explode within a meter-and-a-half from any target they aim for. The ship, built by the Black Sea Shipyard, is manned by nearly 2,500 crew and carries dozens of fighter jets and helicopters. Its main fixed-wing combat plane is the multi-role Sukhoi Su-33 fighter jet, which can perform air superiority, fleet defense, and air support missions and can also be used for direct-fire support of amphibious assault, reconnaissance and placement of naval mines. The ship also carries the Kamov Ka-27 and Kamov Ka-27S helicopters for anti-submarine warfare, search and rescue missions, as well as small transport. RT’s crew was lucky to witness the first combat take-off of Sukhoi jets, which on Tuesday targeted factories and arms depots operated by jihadists in Homs and Idlib provinces of Syria. The exact location of the targets was not released by the Defense Ministry, but a drone video of the attacks has been made public. 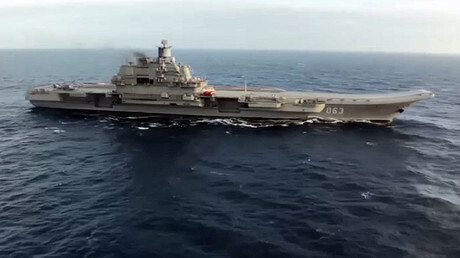 Unlike many other aircraft carriers, the ‘Admiral Kuznetsov’ is also a missile cruiser, as it is facilitated with Kinzhal (Dagger) missiles that it can use to protect itself from incoming aerial attacks. It can also protect itself from enemy warships. The RT crew reported that a military helicopter has been surveying the Russian the naval group off the Syrian coast for days, with the military suggesting it was sent from one of NATO ships also stationed in the Mediterranean Sea.